This unique custom travel mug looks just like the paper cup you'd get at your local coffee shop only it's completely reusable and double walled making for a cooler outside and warmer coffee! 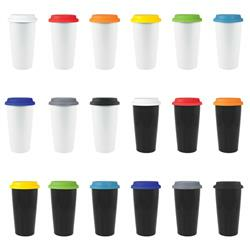 Go green with this great porcelain travel mug with a flexible silicone top!!! 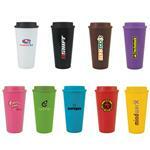 We also carry this style mug in a plastic as well. This is very similar to the "I am not a paper cup style mug" that MOMA introduced a few years ago. 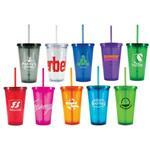 Give us a call to discuss your artwork or other eco mug options at 888-332-ADCO. Black and White with your choice of colored lid. 9 colors available! Production Times Available: 5-7 business days standard for production. FREE RUSH AVAILABLE. Typical Imprint Area(s): 3-3/4 x 3 x 8 (8"w if wrapped around mug). Available Imprint Options: For additional imprint colors, please add $0.55 per piece. Porcelain body with black silicone lid. Double Walled. Dishwasher and Micowave safe without metallic imprint. 24 pieces per box, 36 lbs. Box dimensions 18-1/2 x 13-1/4 x 14-1/2.